These burgers turned out tasty, if rather insipid looking. I usually make them with black beans, but I was in a hurry and used canned cannellini beans. But I doubt that any veggie burgers I ever cook are the same. I think a good veggie burger needs a grain, a pulse and a vegetable. Plus some seasoning. 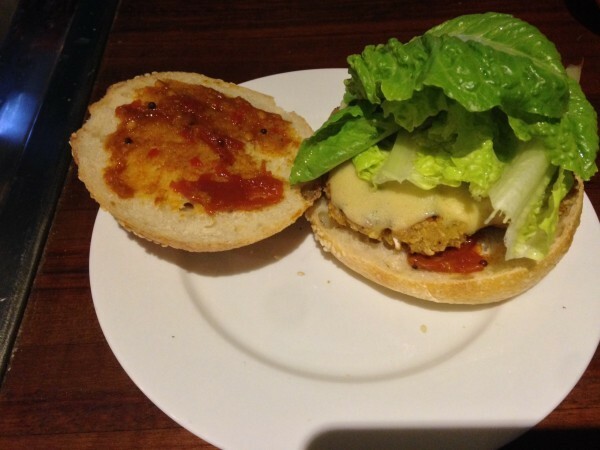 I like this combination, because the grains help them crisp up in a way that a plain bean or veg burger doesn’t. The mix was made up of roughly equal parts of mashed white beans and oats with onion, corn kernels, finely chopped cauliflower, a bit of chickpea flour, cumin, and salt. The mix has improved in the fridge over a day or so.. I fried them up in a bit of olive oil then served them on a sourdough roll from Natural Tucker bakery with some cos lettuce from the garden and some spicy kasoundi relish made by a friend. There is some Cheezly Edam on there too. After my anti-Cheezly rant in the ‘cheese’ post I have to admit is it the least nasty of all the Cheezly I have tasted. I would have used Notzarella, but I can’t find it anywhere at the moment.